This article is about a type of event. For other uses, see Riot (disambiguation). Rioters wearing scarves to conceal their identity and filter tear gas. A riot (/ˈraɪət/) is a form of civil disorder commonly characterized by a group lashing out in a violent public disturbance against authority, property or people. Riots typically involve theft, vandalism, and destruction of property, public or private. The property targeted varies depending on the riot and the inclinations of those involved. Targets can include shops, cars, restaurants, state-owned institutions, and religious buildings. Riots often occur in reaction to a grievance or out of dissent. Historically, riots have occurred due to poor people with no jobs or living conditions, governmental oppression, taxation or conscription, conflicts between ethnic groups, (race riot) or religions (sectarian violence, pogrom), the outcome of a sporting event (sports riot, football hooliganism) or frustration with legal channels through which to air grievances. Today, some rioters have an improved understanding of the tactics used by police in riot situations. 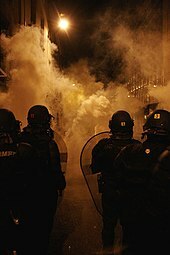 Manuals for successful rioting are available on the internet, with tips such as encouraging rioters to get the press involved, as there is more safety and attention with the cameras rolling. Civilians with video cameras may also have an effect on both rioters and police. 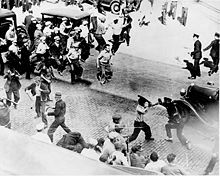 A police riot is a term for the disproportionate and unlawful use of force by a group of police against a group of civilians. This term is commonly used to describe a police attack on civilians, or provoking civilians into violence. Sports riots such as the Nika riots can be sparked by the losing or winning of a specific team or athlete. Fans of the two teams may also fight. Sports riots may happen as a result of teams contending for a championship, a long series of matches, or scores that are close. Sports are the most common cause of riots in the United States, accompanying more than half of all championship games or series. Almost all sports riots occur in the winning team's city. The economic and political effects of riots can be as complex as their origins. Property destruction and harm to individuals are often immediately measurable. During the 1992 Los Angeles riots, 2,383 people were injured, 8,000 were arrested, 63 were killed and over 700 businesses burned. Property damage was estimated at over $1 billion. At least ten of those killed were shot by police or National Guard forces. A high risk of being arrested is even more effective against rioting than severe punishments. [dubious – discuss] As more and more people join the riot, the risk of being arrested goes down, which persuades still more people to join. This leads to a vicious cycle, which is typically ended only by sufficient police or military presence to increase the risk of being arrested. In India, rioting is an offense under the Indian Penal Code (IPC). Each state may have its own definition of a riot. In New York, the term riot is not defined explicitly, but under § 240.08 of the N.Y. Penal Law,"A person is guilty of inciting to riot when one urges ten or more persons to engage in tumultuous and violent conduct of a kind likely to create public alarm." ^ a b Braha, D. (2012). "Global Civil Unrest: Contagion, Self-Organization, and Prediction". PLoS ONE. 7 (10): e48596. doi:10.1371/journal.pone.0048596. PMC 3485346. PMID 23119067. ^ Ashton, T. S., and Joseph Sykes. 1967. The Coal Industry of the Eighteenth Century. 2d ed. New York: A. M. Kelley. p.131. ^ "The Riot Experts". The New York Times, July 14, 1981. Retrieved 2015-04-02. Clover, Joshua (2016). Riot: The New Era of Uprisings. London: Verso. ISBN 1-78478-059-6. This page was last edited on 8 April 2019, at 14:29 (UTC).